In this photo we are applying a wood preservative to a cedar roof in Lake Oswego. The cedar roof preservative we use blocks sunlight and soaks deep into cedar roofs so that no algae will inhabit the wood cells and, in return, no moss will grow. 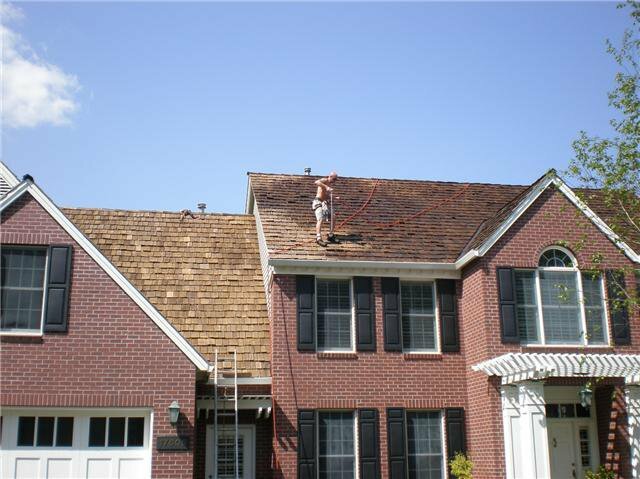 After your first cedar roof cleaning, you will not have to pay for another cleaning again. Your cedar roof will remain looking clean as long as you allow us back every 4-5 years to apply additional cedar roof preservative. What causes cedar shake and shingle roofs to deteriorate? Sun light (UV light): The sun fades and breaks down the wood. Rain: The rain washes away the oils that are naturally found in cedar. Insects: Certain wood eating insects are designed to attack dead wood in order to speed the deterioration process. This is simply part of the cycle of life. Moss, algae and lichen: They thrive on surface softening wood and also contribute to the deterioration of the wood shakes or shingles. Some roof cleaning contractors: Those that use caustic products, misrepresented as wood preservative, actually speed up the deterioration of the wood. Unfortunately, in the Portland area this is very common. What’s the difference between our product and all the others? Chemists found a way to use a resin-locking formula to bind a brown-based copper compound with mildewcides and fungicides. Several kinds of paraffinic oils, used as carriers. These oils carry the active ingredients deep into the wood fibers while the resin-locking feature fastens them onto and into the wood fibers. The high solids content of these products, plus the oil base, ensures that the finish will remain as a “gel” coating. This gel finish, capable of softening in the heat of the sun, will re-fill any microscopic cracks should they appear after a winter’s damage cycle. Before you treat, do your homework. The fastest way you’ll decide which product is the best option is by simply looking at a roof we’ve done vs. our competitors. Call Amteco: 1-800-969-4811. This is the company we get our cedar preservative from (ask to talk to the guy in the lab). Then call Dennco: 1-888-991-4432. If a contractor you’re considering to hire does not list what he uses on his web site, ask why. Ask us to bring you a shake with our preservative on it. Then have another cedar roof contractor bring you a shake with their preservative on it and see for yourself. If you want to see how long cedar can last, an oil based wood preservative is your only option. Some water based treatments such as “Canupsol #5 concentrate” are caustic and will damage wood roofs and the rubber of the pipe jackets. The rubber is needed because it acts as a water tight seal around the pipes that vent your bathroom. Scientific studies by several different universities have tested the products sold as a preservative for cedar roofs; TWP was proven to be the best in every study. Compared to AMTECO’s “Total Wood Preservative”, the best of water based treatments do very little to prolong the life of cedar roofs. The reason only a few contractors use TWP is because it requires a $4000-$6000 spray system in addition to the rather expensive ingredients. It takes even the most skilled employee several dozen jobs of training before he can be trusted to spray the wood preservative without creating any messy over spray. Angel Martinez is our specialist for this service. He makes no mess! We treat your cedar roof right, using 100% oil-based AMTECO-TWP-Radcon 200 series: The country’s top-rated cedar shake preservative treatment. It contains a moss, algae, and fungus retardant, as well as a water repellent and insecticide. We can make your cedar roof 100% clean. It will be the color of NEW clean wood. Some contractors will tell you their treatment will gradually get your roof clean over a period of 3-9 months. What they call clean… we call dirty! We replace shakes only if needed. We do so in a way that the replacement shakes will match the color of the rest of your roof. There are many suppliers much closer by, but we buy from the Sandy Shake Company… they are the best! We use the preservative proven to make cedar roofs last longest. Amteco has been making and testing wood preservative for many years. There are three contractors in the Portland area that buy cedar preservative from me. I sell it to them at no profit in an attempt to provide more examples of what’s possible for cedar roofs. “The standards for cleaning and preserving cedar roofs in the Portland area vary greatly. Homeowners are unknowingly paying contractors to accelerate the deterioration of their cedar roof.